Bharatanatyam and contemporary dancer and choreographer, Navtej Singh Johar began by giving the audience a glimpse of the processes behind his work. He outlined culture, politics, history and philosophy as important aspects of enquiry for him. Patanjali’s Yoga Sutra instead of other conventional texts like Natyashastra, he said, became his entry point into dance. He introduced his fellow panelists – Rizio Yohannan Raj, who specialises in Sankhya philosophy and Justin McCarthy, who has been familiar with Johar’s work from the very beginning. 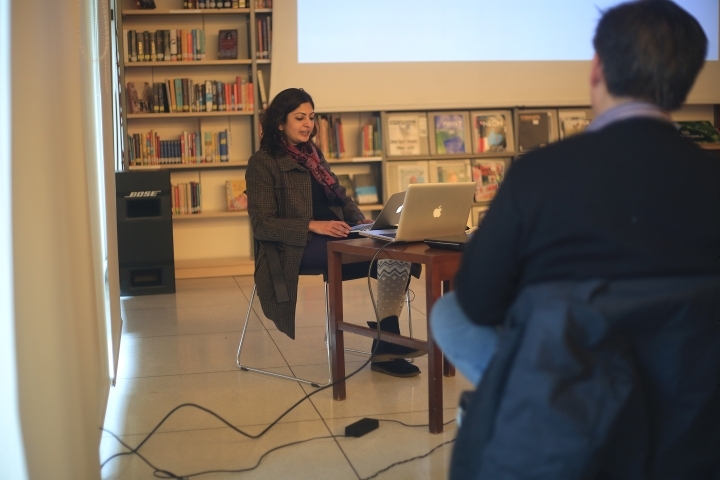 Raj began by saying that making sankhya philosophy a part of everyday life is an important aspect of her work. Philosophy in general is perceived as cut off from everyday life, or it is perceived to have a religious and non-secular background. Explaining her link with Johar’s work, she said that Johar works towards making the world of reflection translatable in daily life. She then asked Johar to reflect on the role of the ‘body’ in his dance. There is a general separation in the realms of body and mind. How does Johar reflect on or see the body and how does the body become a thinking experience? Johar replied by saying that he started dance and yoga training together. The two did not go together at all, being constantly in conflict with each other. He struggled with the question of how dance can become comforting and reflexive rather than an external activity. The possibilities of the body are far richer than creating an image or projecting something outwards. He said he perceives the stage as a space which opens up to itself rather be a place for showing. He views the exhibitionist nature of Indian dance as being almost violent. He said for an image to be live it must comprise of the movement, the submission to the body movement and the effect or the after glow. McCarthy began by saying that Navtej’s Bharatanatyam and contemporary work nurture each other. However, Johar’s Bharatanatyam is significantly different from the ‘official’ understanding of Bharatanatyam. Johar replied by saying that cultural chauvinism today has become a part of appreciating Bharatanatyam. It is important to love dance without subscribing to the chauvinistic umbrella under which classical dance often finds itself. He said he loves Bharatnatyam’s musicality. Justin pointed out the myriad styles of music that Johar uses in his dance, not just traditional Carnatic music. Johar followed this by explaining to the audience the paradox of the lives of devadasis – the paradox of being a priestess and a prostitute at the same time and the possibilities that come out of the following abandon. In the 19th century there were major shifts in this premise. There has been a denial of lived experience and a conscious going back to text. Yoga has gone through the same process of forcible cleansing. If one disowns this lived history one disowns paradox. This amounts to fundamentalism. There are polarities in dance such as sringara and bhakti; modern and contemporary, and with the diaspora opening up, dance as an assertion of cultural identity or just culture. Yohannan then spoke about Johar’s rejection of the proscenium space. How do we understand rejection? She posited Johar’s passionate fervent rejection vis a vis spontaneity and taking things as they come. Johar said that the premise of Patanjali’s Yoga was Sukh. The state of yoga or mindfulness is achieved when there is a play between abhyaas or assertive practice and vairagyam or detachment as opposed to hatha which is dogged determination. It releases the practitioner into comfort. Bodies are made of Tamas which is resisting movement and Rajas, which is movement. Yoga is a fine calibration between energizing one part of the body while exhausting the other. The practice of this leads to Satva which is an unambitious gentle state. The devadasi in her declaration of love is already accepting resignation which is the delicacy or beauty of padam. This is lost if all of it is made into a ‘projection’. The warm act of wanting to be visible without an agenda- being unselfconscious yet conscious of being seen. 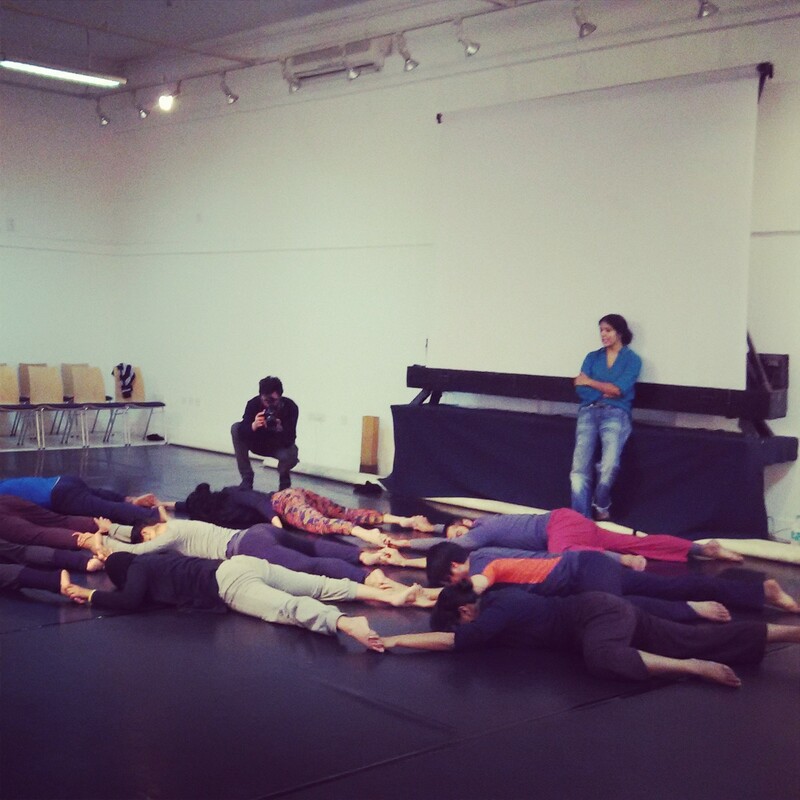 In the open rehersal with Padmini chettur, 9 contemporary dancers took part. All 9 of them lay down on their stomachs to make small diamond spaces in between with legs and arms. This was to understand the notion of keeping the body in motion using interdependence between the dancers and the floor. It was complex in the sense that they had to move themselves and support their fellow dancers at the same time. For her to be able to work with other dancers their physical strength isn’t important, but understanding the inner line of the human body. “Perhaps ego is too big a word. After years of a narcissistic practice that engages the self-image of the dancer in a certain way, how do you engage the in between spaces and manifest your energy in a collective manner? 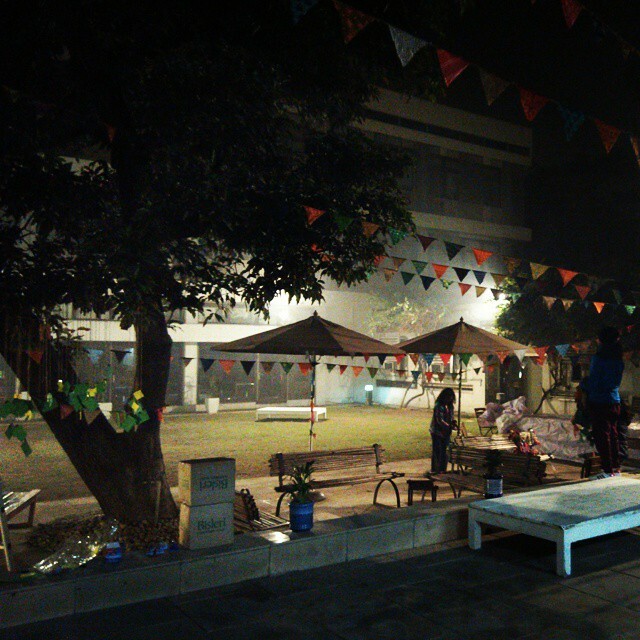 To send energy into collective spaces is in some sense the work we started to do with Chandralekha. Basically, how do you stop bothering about what you look like?